From left, Luís Paganelli Marín and Ryan Sheets. 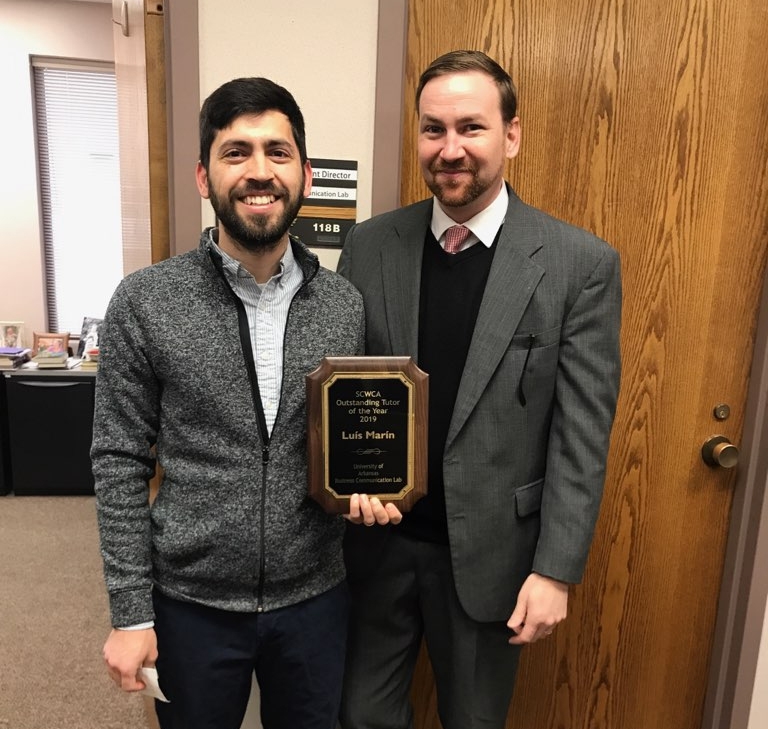 Luís Paganelli Marín, a graduate student tutor in the Business Communication Lab at the Sam M. Walton College of Business and doctoral candidate in the Department of English, was named the "Outstanding Tutor of the Year" by the South Central Writing Centers Association. Marín received the award on Feb. 20, at the association's annual conference, which was hosted by the University of Mary Hardin-Baylor and Temple College in Belton, Texas. Randall Monty, vice president of the association, noted Marín's firm belief that "producing better writers means more than competent communicators: it means a more caring, confident personhood" and Marín's desire "to empower students who are members of historically underrepresented populations in academia and in business." According to the association website, the award recognizes "tutors who provide extraordinary service to the students, the center, and the campus community." Marín has tutored hundreds of Walton College students over his four years at the Business Communication Lab and led dozens of workshops and tutorials. As Ryan Sheets, director of the Business Communication Lab, stated, "Luís exemplifies extraordinary service: he edits our podcast, holds consultations with Walton undergraduate and graduate students, and creates and leads group tutorials every semester." "I'm excited about this award," Sheets said, "because it lets the whole campus community and region know about the wonderful work Luís does."